Home World Politics Guilty Of Negligence In French Court, IMF Boss Christine Lagarde Accused Of Embezzlement Of Public Funds, Takes Flight To Washington Headquarters ! Guilty Of Negligence In French Court, IMF Boss Christine Lagarde Accused Of Embezzlement Of Public Funds, Takes Flight To Washington Headquarters ! The court in France has found the head of the International Monetary Fund (IMF), Christine Lagarde, guilty in the case of the sale of the Adidas company, but did not assign her any punishment. After the court hearing, the lawyer said that he did not rule out the possibility of an appeal. 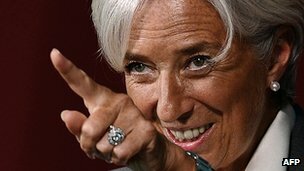 Earlier on Monday, Lagarde’s lawyer said that she had left France and flown to the United States. According to the press service of the IMF, the fund’s board of directors will meet shortly to discuss the decision. In France, the trial is held due to the sale of the company Adidas in 1993 by Bernard Tapie, a known entrepreneur, politician and a close friend of the former President, Nicolas Sarkozy. After the sale of the company, with the mediation of the state bank Credit Lyonnais, Tapie accused the bank of fraud and demanded the payment for the damages. In 2007, Lagarde, the then finance minister, decided to refer the case of Tapie to arbitration, which appointed the businessman over 400 million euros compensation. In this regard, the ex-minister is accused of negligence that led to the misappropriation or embezzlement of public funds.